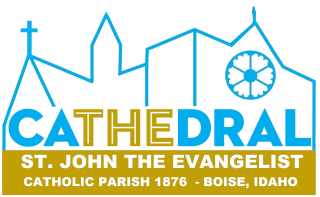 The St. John's Food Bank is located at 815 N. Hays St. in Boise, across Hays from the Cathedral, mid-block, in a small house. We are open Monday through Thursday, from 1 to 3 p.m., except on major holidays. Volunteers to prepare food, wait on our customers, input names and address in computer, prepare bags, stock shelves, etc. Three people work at each shift. Volunteers to help with pick-ups on Mondays at 11:30 a.m. and pick-ups at El-Ada the first Wednesday of each month. Having a truck is a plus, and we need men who can lift boxes. Volunteers to donate a case of one particular food item each month. St. John's Food Bank needs canned beans, canned tuna, saltine-type cracker, and soups. We give out pre-made bags/boxes for families who need assistance. We also have items for our travelers. We have three volunteers working each shift to help our clients with the choices, record ID information, and prepare bags and stock shelves. We receive our food from the Idaho Foodbank and El Ada Gov’t Commodity program. We also receive diapers from the Idaho Diaper Bank. Customers are allowed to come two times each month. We have set volunteers at each shift, but we also have a substitute list in case our regular volunteers cannot make it. We have a few gentlemen who help with pick-ups at the various places. We have a Food Bank Sunday at our parish on the third Sunday of each month, when our parishioners bring cans of food to mass and leave in the wooden bin (or around it) in the vestibule in the back of the church. We have a few families who take turns bringing the food from the church to the Food Bank. We have a monthly food donor program where people donate one case of food each month to our food bank. They can drop off when we are open, or leave in the back of the church when they attend Mass.